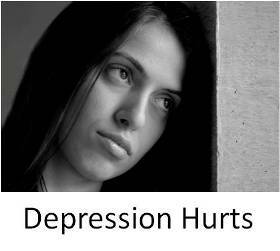 Depression Hurts: Am I In Depression?? I feel really down all the time. life seems a burden...a drag. I just wanna die!! Help me please!(sob). Thanks so much for reaching out. Although you wrote very few words, I can truly feel your pain and loneliness. If you are contemplating suicide then depression is clearly something that you are dealing with. However, it could be coupled with other conditions as well. In order to know what is really going on, a lot more information would need to be disclosed. For instance, do you have a family or personal history of depression? Do you use / abuse drugs or alcohol? What other symptoms exist that need to be considered? To learn more you can check out some of my other pages such as teen depression , depression symptoms, and types of depression. I commend your courage to reach out for help. It might be beneficial to talk to someone in person. I'm not sure where you are located but you can check out my depression hotlines page. Depending on your age (teen, young adult) and your situation (depression, being abused, struggles with alcohol, etc.) you can scroll the page and find the right hotline that you can call to get some support. Also, the good thing is that they are all trained and most hotlines are "open" 24/7. If you can, I'd recommend seeing a mental health professional in your area in order to get a proper diagnosis. Contrary to popular belief, there are free mentalh health resources where you can find someone local, get properly diagnosed and recieve the treatment you need to be happy again. Statistically, once someone gets properly diagnosed and begins treatment, they start to feel so much better in just a couple of weeks! You can too! Also, just a word of advice. Don't ever let anybody tell you that you are worthless, that you are no good, that you aren't loveable! If anyone ever tells you that, know that they are absolultely wrong! We are all amazing in our own unique way. We all deserve to be loved. Learn to love yourself and you will attract love from others as well! I wish you all the best! And, thanks again for reaching out!